Can you believe this weather – so chilly in August, now hot in September! Tom went to Plymouth Camp State Park on Saturday and there 20 -30 people there, most of them swimming, too. It was an amazing concert to raise funds for the UCC Emergency USA Fund this past Sunday at church. Headlined by Jamie Ward, it included a range of performers including: Eric King, Luke Zelis and our own Tesha Buss. It was wonderful to finally meet Tesha’s daughter Isabella, too. 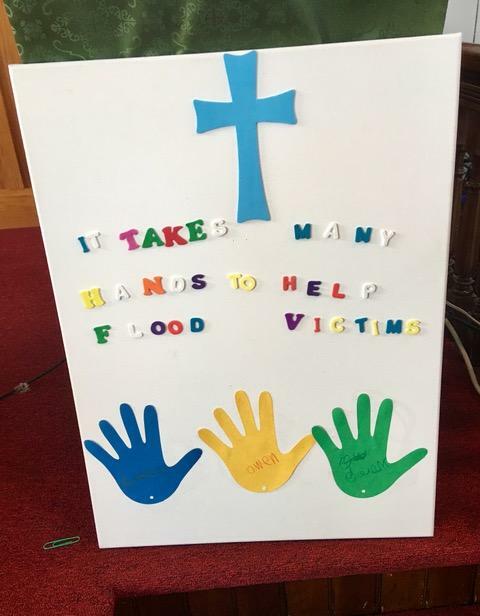 We had three other youngsters join us on Sunday and they made this sign using their hands and adding their contributions. Several people who could not attend sent checks to help recent hurricane victims and we will be accepting donations for the next couple of weeks. Checks made out to Tyson Congregational Church and noted to be for the flood relief effort can be sent to our mailing address, 39 jDublin Rd, Ludlow 05149. Since the UCC sent us funds to disburse when Irene paid us a visit, we feel strongly that we should pay it forward. I heard from Michelle Pingree that it was a harrowing experience being in FL while Irma was passing through. She and Justus saw destruction in the Tampa area & noted flooding in Sebastian, where her mom lives. Don’t forget the Reach Out Luncheon in the Community of Tyson Church on Thursday, 9/21! The next book club meeting will be Thursday, October 12 at 6:30 pm at the community center. The Immortal Life of Henrietta Lacks by Rebecca Skloot should provide an interesting discussion about ethics in science. 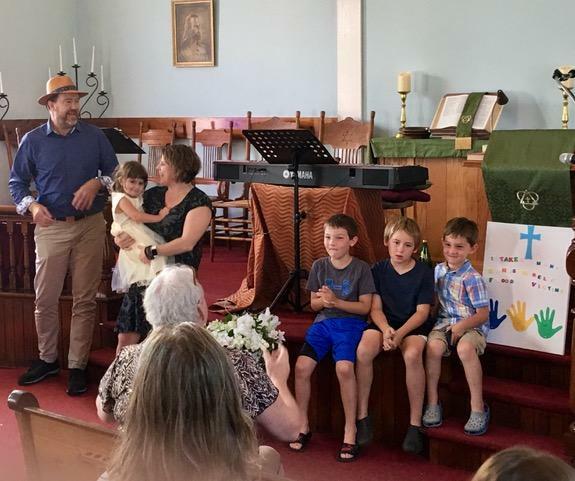 This entry was posted in Community News and tagged Apple Festival, book group, Calvin Coolidge Historical Site Museum and Education Center, Camp Plymouth State Park, Grace Coolidge Musicale, Plymouth, Reach Out Luncheon, Tyson Congregational Church. Bookmark the permalink.